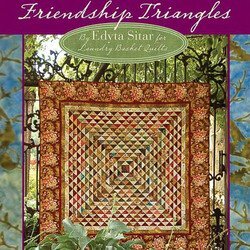 From Edyta Sitar for Laundry Basket Quilts. 15 beautiful quilting projects, Half-square triangle exchange ideas, easy step-by-step triangle technique, using the half-square triangle exchange papers. 80 full colour pages filled with hundreds of photos and illustrations. 15 half-square triangle projects including table toppers, table runners, wall hangings, quilts and easy tote bag and book cover.